RAILROAD.NET • View topic - PC color: jet black, or DGLE? PC color: jet black, or DGLE? Re: PC color: jet black, or DGLE? The confusion exist because as late as Oct 1970 paint drawings still called for 3 coats of Dark Green Enamel REF 47-266637. At the same time calling for fuel tanks trucks and all underframe equipment to be painted Black Enamel REF 47-266806. Not sure that the PC Dark Green was the same as the PRR Dark Green. The one drawing for the PRR calls for Dark Green loco paint PRR shade. RE 47-2626. In the end they all looked black to me. scottychaos wrote: there is no question that all PC locos were black. there is no question that the NS PC heritage unit is black. and its not true that you cant easily tell the difference between Brunswick Green and Black..
in reality the difference is quite obvious and apparent.. unless you are colorblind, you can see it clearly.. Photos prove all the above points again and again.. I'll beat this dead horse just one more time. Even fresh out of the paint shop it is difficult to see any color difference between the dark green body and the black underframe. Add a few months of road grime and the difference is even more obscure. Early Penn Central documents indicate that DGLE was specified for PC locomotives, at least in the beginning, at least in some shops. Years ago I spoke with a gentleman who had retired from GE Erie, and he showed me the actual DGLE drift card that was used to match the paint applied to brand new PC U33C's. But you'll be hard pressed to find any photo of a PC U33C in which they look anything other than black. I have no doubt that later PC locomotives were just black, but you can't tell the difference by looking at photos. Regarding NS 1073, when the SD70Ace was brand new (and only when it was new) you COULD see a slight difference between the DGLE body and the black underframe while in bright sunlight. But don't take my word for it. Ask the gentleman who researched and designed the NS heritage paint schemes. Ask the NS folks who were familiar with the project. Ask the people at EMD who actually painted it. Bottom line is, unless you're a rivet counting technical kind of person (nothing wrong with that), it doesn't matter because nobody will be able to tell the difference anyway. the Metro Region in semi-gloss "Black Dip" with white lettering. The NE Region freight units(U23B's and RS-3's/Dewitt geeps) were Dull,Dirty Flat Black! Some years ago I read an article about scientific illustration. Paintings were actually PREFERRED to colour photographs in a nature guide. Part of the reason was that a painter can show the animal in its real colours: a photo will display colours that are in part due to the light reflected from the animal's surroundings. I think the same principle could apply to locomotives! THANK YOU! for this information! that really puts a new spin on this whole debate.. But perhaps there are in fact TWO completely different PRR Greens on diesel locomotives?? this is new information to me..
and it explains a LOT! "PRR green is absolutely easily distinguishable from black, you can tell them apart very easily." 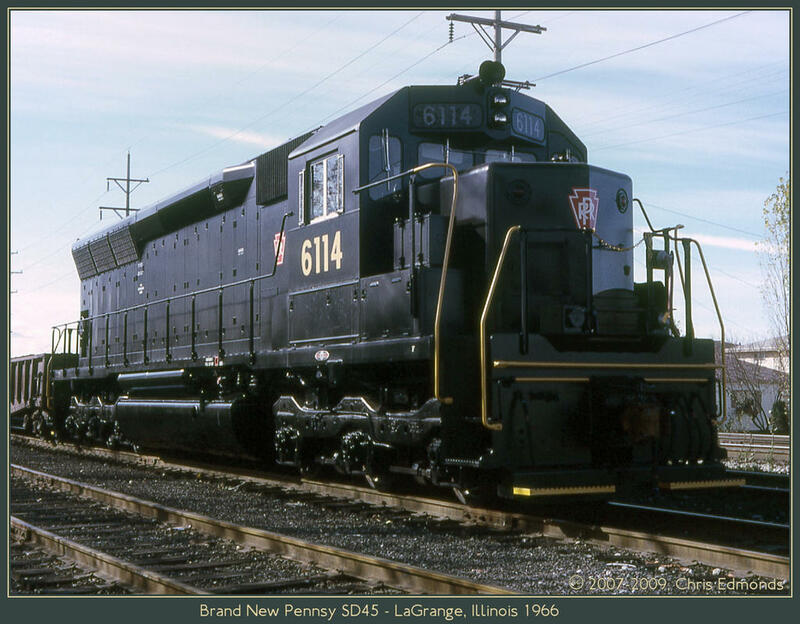 "PRR green is virtually indistinguishable from black, you can not tell them apart except in perfect conditions, fresh paint and very clean locomotive." I have always assumed one of those has to be true, but not both..
and I have gone with the first one being true, because photos easily show it to be true..
but if we have two *different* greens, both can be true! *mind blown*..
you *can* just barely tell the difference between the green on the locomotive and the black of the trucks and frame..
but yeah, its close..and its obviously *not* the same color as the "Brunswick green" on the photos of the cab units I posted earlier.. This might be "old news" to die-hard PRR historians..but this is not something that has been generally known among railfans at large! considering we have been having this same discussion for many years, and this is the first time I have ever seen this idea of "two different greens" ever mentioned before..
and all over the internet, people are always assuming "Brunswick green" and "DGLE" are the same color..now it seems perhaps they are not the same color at all..
"PRR green is virtually indistinguishable from black, you can not tell them apart except in perfect conditions, fresh paint and very clean locomotive"
So..now, is it really TRUE that "Brunswick green" and "DGLE" are two different colors? it seems to me that it has to be..but the common wisdom is that those are synonyms for the same color..
it seems that must be wrong..that's the next great debate! scottychaos wrote: So..now, is it really TRUE that "Brunswick green" and "DGLE" are two different colors? Hey Scot, I'm not an expert on PRR/PC locomotive colors. Actually I don't think there are very many people around who can definitively explain all the subtle shade differences and when they occurred. I grew up in the 1960's believing PRR locomotives were just plain black because that's how they appeared to my eyes. What an interesting revelation when I discovered that they were actually VERY dark green! From all the photos I've seen, the earlier PRR locomotive color seems to have been slightly more green than it appeared in the 1960's. When that change occurred (if there really was a change), I don't know. As others have pointed out, there really are old PC documents floating around that specify "dark green" or "brunswick green" as the locomotive body color. I think it's fair to assume that ex-NYC paint shops used plain black all along. And eventually everything went plain black. So in my opinion, the answer to the question "Did PC paint locomotives jet black or DGLE?" is "yes". Thanks again Bill, fascinating stuff! im very interested in color..judging color was once literally my job! I worked at Kodak for 17 years, and judging color reproduction was actually something I did for a time..Kodak research was big into color. its an interesting subject..and being a LV fan, the discussions around Cornell Red are endlessly interesting! (LV fans have finally nailed down that controversy very well..there is really no longer any question about what Cornell Red should look like..
Im now quite convinced that there must be two different and distinct shades of green used by the PRR. again im going back to "photos dont lie" as the basis of that opinion..
must be two different shades of green, when new. the green, when compared to black, is highly obvious on the cab units..its really "there" and quite easy to see..
however I do (now) agree that the green on the later hood units is REALLY close to black..
yes, those were almost certainty patched PRR units, wearing PRR paint but patched for PC. If the road numbers on the cabs are yellow, thats a giveway that its PRR paint. but that has never been confirmed..IMO it's an urban legend, and probably not true. 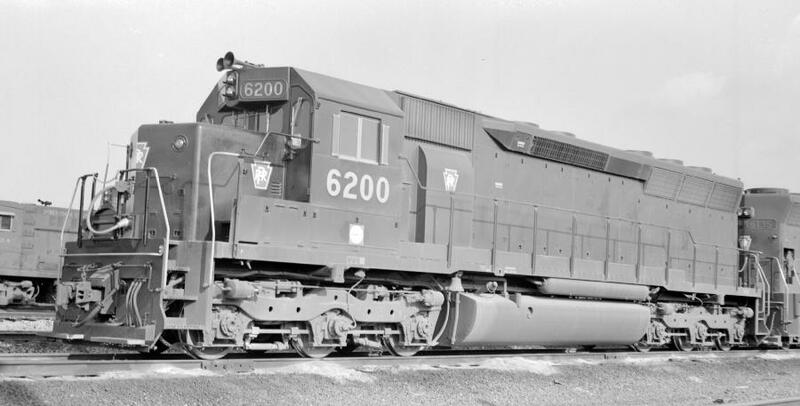 The last units painted for PRR were SD45's 6200-6234, which were new in January 1968, and arrived in PRR paint. it is recorded that the last one painted, and the final locomotive ever painted for PRR, was SD45 6207.
ordered by PRR, but delivered to PC starting in Feb. 1968. They arrived in PC black paint with PC markings. Backshophoss wrote: With the rare PC "worms" in green(P) and white(C)the semi-gloss Black DIP with white lettering was the "standard"
that weathered to Flat Black real quick,and PC power was rarely washed to boot. There were red P, white C, and white P, orange C logos applied to locomotives, but I have not seen any that had any with a green P. Were there such units? I googled it, and there is only one mention of a "green P" on the entire internet, and its this thread! The "Fallen Flags" rail image site has recently (put up 1 August 2016 to 10 August 2016-- check soon and they will still be in the site's "Recent Additions" index) added a bunch of photos of PRR diesels, all identified as "Jim Parker photos." (They may include EMD and Baldwin units, but I only looked at the Alcos and GEs.) Most of them show a very easily perceptible greenish hue, and in at least some it seems unlikely they were reflecting light from grass or foliage. Penn Central E-8 #4263 was painted DGLE, evidently in the late 60s/early 70s and then never painted again, even when it was sold to the MBTA. After it was retired, the unit spent several years in a yard in Somerville, just north of the Boston Engine Terminal. I photographed this engine in the mid to late 80s and at that time the paint had weathered to a medium/dark green. thus more pronounced than the green applied to diesel units.